Mohammed Morsi may be unpredictable new factor in Egypt’s relations with the United States and Israel. Egypt’s new president has some strange ideas and is a bit unpredictable. But one thing we shouldn’t do? Underestimate him. Photo by Ahmad Abdul Fatah/AFP/GettyImages. Moments before Mohammed Morsi, Egypt’s newly elected president, took the stage to address tens of thousands of jubilant supporters in Tahrir Square last Friday, a voice rang out over the loudspeakers entreating the revelers to stop setting off fireworks. Morsi clearly did not receive the message. For almost 40 minutes, the man many Egypt-watchers had derided for lacking charisma gave what could only be called a barn-burner. At one point, Morsi burst out from behind the podium, shouted “you are the source of authority” to the adoring crowd, and then ripped open his jacket to show that he wasn’t wearing a bullet proof vest. 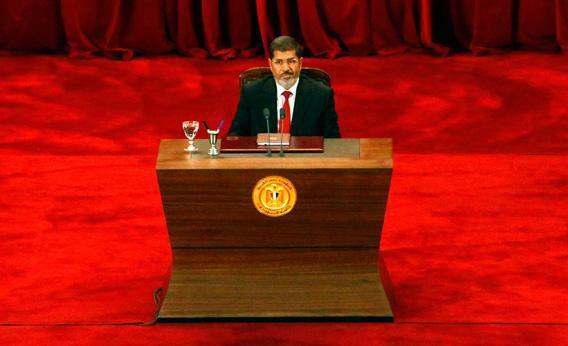 For many Egypt watchers, Morsi’s pledge was puzzling. Ask any Egyptian to recite from his country’s long list of woes, and the imprisonment of Omar Abdel Rahman is unlikely to earn a mention. In fact, for many Egyptians, Abdel Rahman is a relic of the bad old 1990s when his Islamic Group conducted attacks against tourists and Christians, prompting a brutal (and largely popular) government crackdown on militant Islamists. For the past 18 months there has been an ongoing “Free Omar Abdel Rahman” sit-in near the U.S. Embassy in Cairo, but it is a small affair, usually looking more like a family picnic than a protest. So for Morsi to use one of his first major speeches to call for the cleric’s release was odd at best and ill-advised at worst. Predictably, New York politicians lined up to express their offense at the new Egyptian president’s remarks, with Sen. Chuck Schumer decrying it as “an insult to the memories of the victims of the World Trade Center Bombing.” Secretary of State Hilary Clinton chimed in to assure Egyptians that the case against Abdel Rahman was strong and that he had benefited from due process. Morsi had not been on the job 24 hours before causing a row with Egypt’s largest international patron and trading partner. The chance that Abdel Rahman will soon be back in Cairo issuing murderous fatwas is close to zero. What’s important about Morsi’s comments—and the response they provoked—is not what they say about Abdel Rahman, but what they say about Morsi and the position he now occupies. In the days before the election, the ruling military junta crammed through a series of last-minute amendments to the country’s interim constitution, stripping the president of the ability to declare war or command the army, among other things. Informed opinion in Cairo has generally been that Morsi is so constrained by the generals’ constitutional engineering that he will be the equivalent of a nonentity, at least when it comes to setting the country’s foreign policy. His speech in Tahrir reveals the limitations of that thinking. After all, Morsi is the first person in Egypt’s very long history who is able to say that he was elected by a majority of voters. That popular legitimacy, combined with the inherent totemic power of his office, means that Morsi can do a lot to set the course of Egypt’s domestic and foreign politics. And, as we saw in Tahrir on Friday, he can often do it straight from the podium. The true guarantee of the peace treaty is the adherence to its provisions by the two parties. The introduction to the treaty calls for comprehensive and just peace for all of the peoples of the region, and the right of Palestinians to return to their country, and the right of Palestinians to establish an independent Palestinian state with Jerusalem as its capital […] Where is all of this in Israel’s behavior? What all of this suggests is that under president Morsi, the slightest tension between Egypt and Israel could precipitate a full blown collapse in relations. And the ingredients of some future rupture have been brewing for some time. Since Mubarak’s overthrow, Israeli security experts have increasingly talked of the Sinai peninsula in almost the same terms that the United States uses to describe Pakistan’s Taliban-harboring Northwest Frontier province—an ungoverned territory in which shadowy terrorist groups have a free hand. Increasingly, the Israelis seem to see it as their responsibility to tame that territory. Last August, Israeli helicopters pursuing Palestinian militants across the border from Gaza accidentally killed three Egyptian soldiers. Though the event spawned protests (and a break-in at the Israeli Embassy), the Israelis apologized, and Egypt’s ruling generals responded with equanimity. If the same thing were to happen under a Morsi presidency, it is unlikely that the president would accept a simple apology. If the relationship with Israel is about to become more fraught, so too is the relationship with the United States. Back when Morsi called on the Egyptian government to arm Hamas in 2004, he also called for “revising” the relationship with the United States, which he said was “the true assassin” of Palestinian leaders because of its pro-Israel vetoes in the U.N. Security Council and its provision of Apache helicopters and F-16s to the Jewish state. In Morsi’s eyes, the malevolence of the United States extends beyond its support for Israel. Though the Egyptian president earned his doctorate from the University of Southern California and has two children who are U.S. citizens, his time spent here does not seem to have left him with warm feelings toward the United States. Morsi, for example, rejects the official narrative of 9/11, saying that it is impossible that the Twin Towers were brought down by hijacked airplanes. Morsi first expressed this sentiment in a 2005 interview with CNN, and he took heat for it within the Brotherhood, since at the time the organization was trying to polish its international reputation. Nevertheless, he repeated the 9/11 conspiracy theory five years later. The fact that he would repeat such an incendiary charge, in almost the same words, suggests how deeply he believes this “truth” about America and its leaders. Given the new president’s inclinations, some Egyptians have calmed fears of a sea change in Egyptian foreign policy by suggesting that the military would not allow Morsi to pursue a more bellicose line with Israel or endanger Egypt’s status as America’s No. 2 client in the region. Naguib Sawiris, an Egyptian industrialist and founder of the Free Egyptians Party, recently told a Washington audience that even if Morsi wanted to cancel the peace treaty, the idea that the army would acquiesce is “fictitious.” Though Morsi may not wish to precipitate a showdown with the military over this issue just yet, it’s not at all clear that he’d lose. The only card the military could play in such a confrontation would be the threat of a coup. And though it certainly could pull one off, it would be faced with opprobrium abroad and a likely replay of the Jan. 25 revolution at home. After all, it’s difficult to imagine the hundreds of thousands of Muslim Brotherhood members, let alone the countless other Tahrir revolutionaries, reacting with indifference when the army moves to remove a leader widely seen as trying to free Egypt of foreign tutelage. For the moment at least, the generals are in a weak position, and they know it. The best evidence of the generals’ sense of their own vulnerability is the fact that they spent the days before Morsi’s election frantically trying to write the military’s independence and supremacy into the country’s temporary constitution. Though many viewed this as a “soft coup,” it is probably better understood as an act of desperation. An army secure in its command of the political landscape, and assured of its ability to sweep aside opponents, would not need to resort to the kind of constitutional acrobatics Egypt’s generals did. But the junta must have known implicitly that once a president was in office, its ability to defy him would be limited. They’ve tried to give themselves the cover of laws, but what are laws in the face of crowds? Of course, the balance of power could shift again, especially if Morsi proves a failure on the domestic front. So far, however, he has made some politically (if not necessarily economically) deft moves. One of his first acts in office was to announce a 15 percent bonus for government employees and a 33 percent increase in public sector pensions. Though it’s not clear that Egypt has the money to pay for these handouts, in the short term it shores up the new president’s support among those for whom the Jan. 25 revolution was always about redistribution and economic justice. Moreover, in what could prove a brilliant piece of political jujitsu, Morsi has declared his intention to appoint a national unity government, with a non-Islamist in the role of prime minister. (Rumors in Cairo have swirled around the possibility that Nobel Laureate Mohammed ElBaradei may get the job.) If Morsi’s prime minister does a good job, the president will get credit for having chosen him, and for having governed in a consensual, cooperative, and nonpartisan manner. But if, as is likely, the new prime minister proves unable to do the impossible and the economy continues its free-fall, Morsican shift the blame away from himself and his Muslim Brotherhood. The monuments of ancient Egypt—its temples and tombs and pyramids—stand as testaments to that country’s genius for religion and for the deification of its leaders. As the representative of an Islamic movement who now occupies the pinnacle of power in the land of the Nile, Morsi will likely find himself the beneficiary of both. We’d do well not to underestimate him.